The quality of our surf courses are the top priority for us here at Planet Surfcamps. 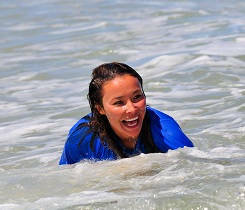 We don’t only have high-quality equipment, also our teachers are all licensed surf instructors and lifeguards. Furthermore, it is very important where the lessons take place. We take you to carefully chosen spots where the conditions are best for you. In our lessons we treat surfers of all levels individually, to give them the best support and help to advance fast. The group contains 8 people so we have enough time to look after each of you and guarantee safety on the water. 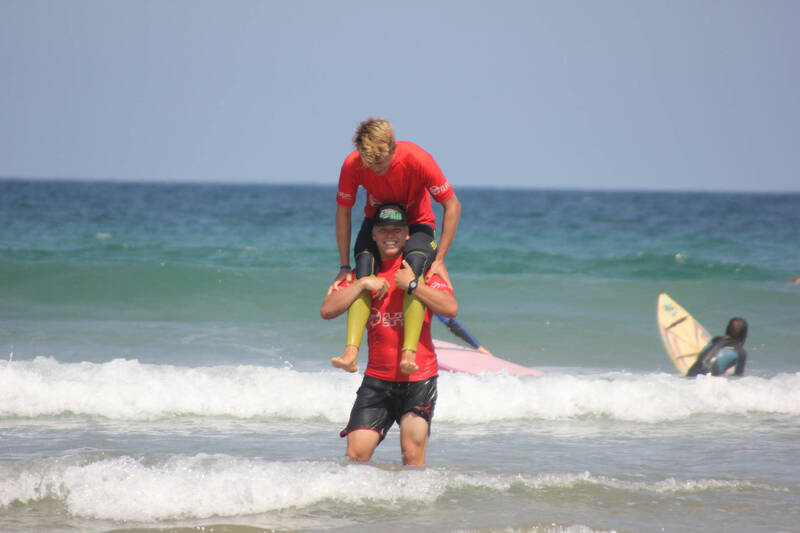 Our surf courses are mostly practical, but a small part of theory is essential. Our instructors will teach you about waves, tides, currents and other useful things for your surfing. Every lesson takes four hours. We have made the experience that too long surf sessions don´t do any good to your learning because the body gets too stressed, especially in the beginning. In the BEGINNER surf courses we teach you the right take-off technique to make you stand on the board. The goal of the lessons is to familiarize you with the sea and waves to make you feel comfortable in the water. This includes also some theory but don’t be scared: it is mostly about trying things out yourself and having fun with surfing. The INTERMEDIATE surf courses are for surfers who are already familiar with surfing the whitewater. We want to surf the first unbroken waves with you and try to teach you the first turns. Our surfinstructors are all really good surfers and they will give you good tips to get your surfing to the next level. So you are able to surf green waves vertical and you feel comfortable in waves up to 1.50 m? Then you will be taught in our ADVANCED surf courses. Our instructors will go surfing with you and try to spot and improve your mistakes. Through effective coaching you will soon be able to do your first turns. Our instructors will give you valuable tips so you get the chance to optimize your surfing and improve your abilities on the board during the time of your stay. Good surf courses include then: high quality equipment, licensed surf teachers who are able to teach you the right technique to stand on the board fast, but also with a lot of fun!